"This is the first recording of the seventeenth-century masterpiece, The Book of Perrine. 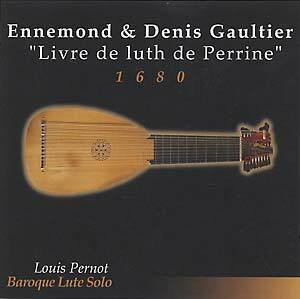 It comprises some of the most beautiful pieces exclusively written for baroque lute by Ennemond Gaultier, professor to the Queen of France, and his equally notable cousin, Denis. Much of the score was lost until quite recently, and the French, master lutenist, Louis Pernot has worked tirelessly for the past decade to perfect its performance. The historical importance of this disc to the world of classical music cannot be overstated. Unlike most other lute pieces, this one was transcribed by Perrine, a contemporary of the authors, from tablature to a more precise, modern technique. This has made The Book a fabulous, interpretive tool for other pieces; a sort of Rosetta Stone for the lute world, as the score gives indications about left and right hand positions, ornamentation, arpegements and articulation. The harmonies are unique, surprising, and at times downright bizarre -- qualities that hint at the book's overall genius; This recording allows us to hear for the first time, as closely as possible, the original interpretation of those ideas."